I was ten years old when my father opened up the family laptop to show us a new wonder. The program Photoshop CS3 had just been released, and we were lucky to have it installed thanks to the company my father worked at. To celebrate, he also bought a $30 Hanvon brand tablet so that we could operate the computer with a pen instead of a mouse. My brother and I immediately took turns creating a masterpiece: two fish, labeled with our initials, doing nothing in particular. This image sparked my interest in this seemingly exotic medium. Over the years, I practiced almost everyday for hours on end. 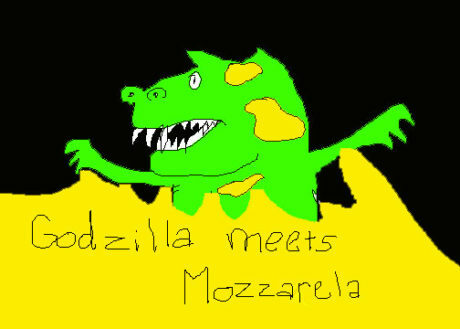 I started simple, copying a “Godzilla Meets Mozzarella” comic from the New Yorker. As I grew older, I drew more digital images based on my interests. 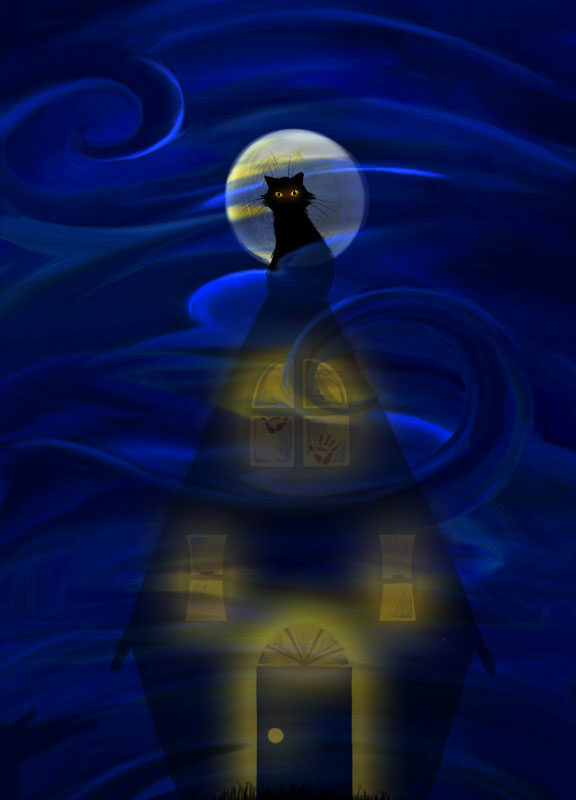 I made cartoons such as a black cat perched on a house with creepy hand prints for Halloween. 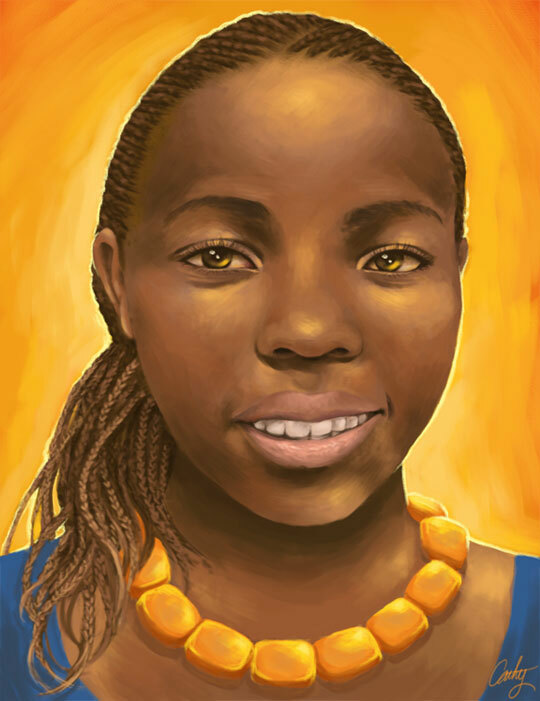 Eventually, I evolved to painting portraits of my friends that had more depth and volume to them, as I learned changing the opacity of the brush could give a painterly effect. Around middle school, I was utilizing Photoshop to a degree that when my parents walked by, they would notice how my digital pieces were similar to my oil paintings. After five years of constant use and an accidental spill from a cup of water, my poor Hanvon tablet sputtered to its end. For my fifteenth birthday, my parents searched for and purchased a second-hand Wacom 21UX tablet, which I still use to this day. This was the best present I had ever gotten in my entire life at that point, and I was determined to prove to my parents that their investment in this tablet was worth it. I spent a week painting an elaborate kitchen with my new Wacom. 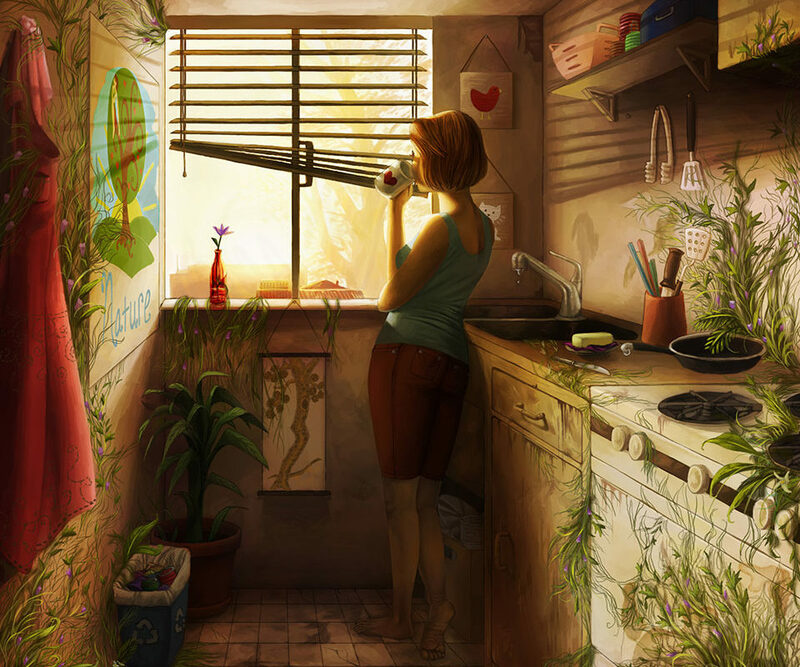 I remember painstakingly searching online for various kitchen references, drawing and redrawing perspective lines, and the care I put into experimenting to find the perfect colors for the gold lighting of a rising sun. I posted this finished painting on DeviantArt and titled it ‘Regnum Plantae’, which means plant kingdom in Latin (I actually had no idea what title to use!). 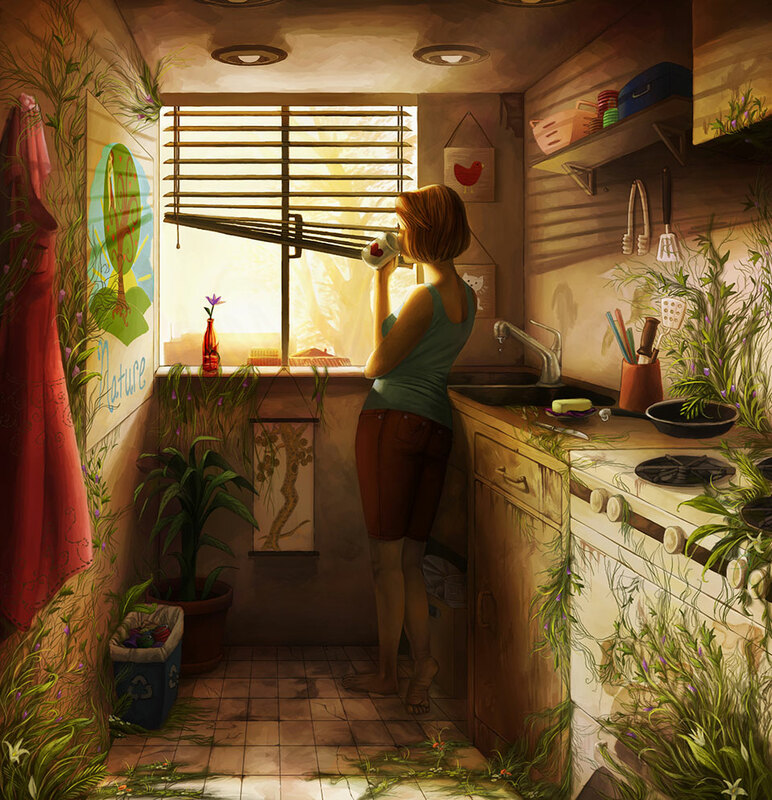 ‘Regnum Plantae’ was featured as a “Daily Deviation,” and shown on their homepage for a day. When I saw the attention my digital painting received, I realized it had potential. I ended up submitting this piece to various competitions and received recognition and awards in my local community as well as in the Scholastic awards, garnering a silver medal. However, with the exposure came reactions that I did not expect. I remember I once excitedly described the success of my digital painting with a teacher. When he asked what medium I used, I replied with Photoshop CS3. “Oh,” he responded, “so you just manipulated several photos together.” I immediately sensed the dismissive tone in his voice. 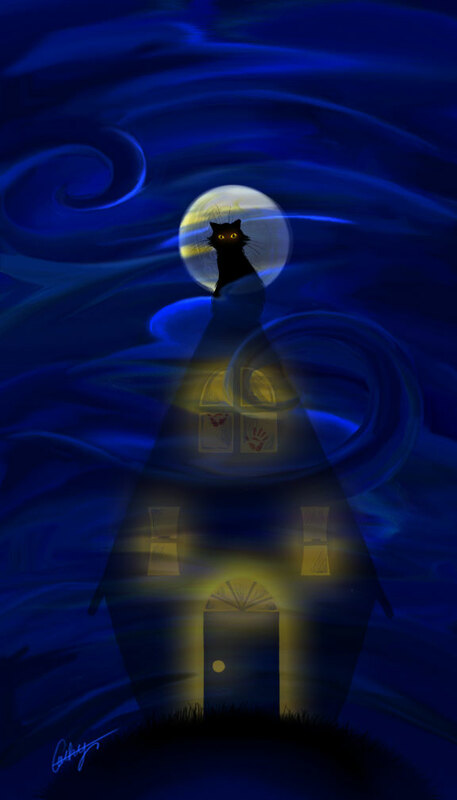 I was surprised – sure, Photoshop is used to manipulate photos, but I drew and painted this image from scratch, and it was my honest painting, no photo manipulation involved. There were plenty of other people who regarded digital work as inferior. One incident I remember vividly was when ‘Regnum Plantae’ was selected for the school district art show, and it was one of few that was given an award and displayed with a special shiny plaque next to it. I was beyond excited, and when I went to see my painting in the show, I was shocked to see that they had mislabeled the media as “oil” instead of “digital.” I wondered, if the school board had known it was a digital painting, would my piece still be in a place of honor? Discouraged from this experience, I stopped working with Photoshop and my tablet altogether for a brief period of time. I thought that if others couldn’t acknowledge my skill because of the digital medium, I would have to use traditional drawing materials from then on. I was upset that I felt compelled to stop using a media I loved. Although I enjoyed painting with oil and acrylic, my mind still raced with ideas for digital paintings. However, because of Regnum Plantae, many of my friends began making their own digital art. When I saw their surprise and joy with this new medium, it drew me back to my tablet. I saw their digital work improve gradually, and I realized that I went through the same process. Although digital media might have been foreign to some people, my ability was definitely no fluke. Nowadays, digital art has exploded and become much more common than it was back when I first received Photoshop CS3. Everyone I know who likes to create art almost always has some program for digital drawing and a tablet, and there is even a digital art class requirement in the school I go to. Today, whenever an artist lists their skillset, digital media is always involved. I still dabble with Photoshop (upgraded to CS6) but I also use plenty of other traditional drawing and painting media. If I have an idea that works best with a specific media, I don’t hesitate to use it, no matter if others dislike or don’t understand it. Ultimately, validation for your artwork and artistic decisions should not be centered around other people, and making art that you enjoy should never be affected by preconceptions, but rather be available for open minded discussion. Whether it be digital or any other practice, as long as it is fulfilling and challenging for yourself, your ability as an artist will continue to grow.